For certain applications the inlet size of a rotary valve is more important than the capacity. This certainly applies to spray drier applications, where a large volume of air is used to dry a small amount of product, which tends to bridge at the outlet. The product when dried has to be discharged out of the drier and quite often, is pneumatically transported to its final destination. There are several major companies worldwide that are involved in engineering and supplying this sort of equipment. DMN specifically designed 6 valve sizes aimed at these companies. The valve sizes are BL175/200 (5.5 l/rev), BL200/250 (10.5 l/rev), BL250/300 (19l/rev), BL300/350 (34 l/rev), BL350/400 (58 l/rev), and BL 250/350 (19 l/rev) The first number designating the normal valve size and therefore the capacity and the second number being the inlet size in millimetres. Valves can be supplied conforming to USDA requirements for applications in the Dairy industry. They can also be independently approved to be explosion proof up to 10 bar and act as a flame barrier in the event of a dust explosion. Valves are currently available with either stainless steel or aluminium body and end covers and a stainless steel rotor. DMN-Westinghouse valve are made as standard from AISI 316, with other materials are available on request and the range includes airlocks with extra large inlets (AL 175/200, AL 200/250 and the AL 250/300). All DMN-Westinghouse Valves can also be supplied with a Rotor Interference Detection System (R.I.D.). This helps to ensure that any misalignments or metal-to-metal contact encountered after dismantling or cleaning is detected and that start up of the valve is impeded. The R.I.D. will also monitor the valve during operation and will signal if there is metal-to-metal contact whilst processing. Ceramic bearings are used with this system to isolate the rotor from the rest of the valve. 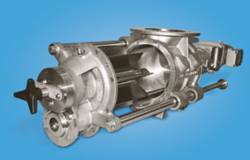 DMN-Westinghouse has been designing and manufacturing rotary valves, diverter valves and other related components for the bulk solids industry for more than 40 years. Offering tailor made solutions for the mineral, chemical, food, plastics, pharmaceutical and other industries, DMN products are distributed worldwide. As well as an extensive range of standard components, the company also supply components conforming to USDA requirements and pressure shock resistant up to 10 bar, as well as ATEX compliant to Directive 94/9/EC, including for use with ST2 rated powders.